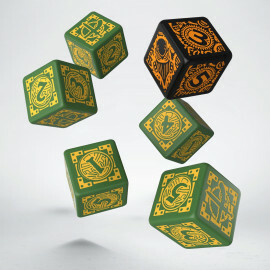 In cooperation with Paizo Inc., Q WORKSHOP is pleased to present a unique set of dice for the Pathfinder RPG series and many more. These are the first such refined, ornamented three-dimensional on edges metal dice we've designed. This new technology and raw material charmed us. It was our great discovery that dice can be a work of art and a hard tin is ideal for creating complex carvings and ornaments. These dice are different from the metal sets found on the market, that sometimes may be gilded, but are still quite simple, with ordinary numbers and nothing more. 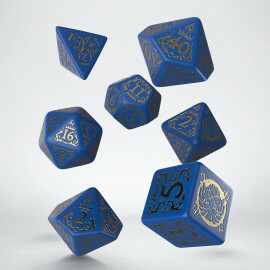 This extraordinary dice set is entirely made of metal and will not scratch easily. The set goes together with a beautiful box, finished with red material, available only with this set of dice. There is no doubt that this is a premium set crafted from selected materials. This sensational dice set combines high usability (both for players and the master of the game) with superior aesthetics and performance. This set of dice was originally created using Kickstarter service, with over 2,300 supporters. They liked the idea to enrich the game of their favourite Pathfinder RPG not only by buying numerous manuals but also with metal dice, which are simply beautiful. Take them in your hands, then warm up, because the metal is cold like the heart of the Game Master and voilá! 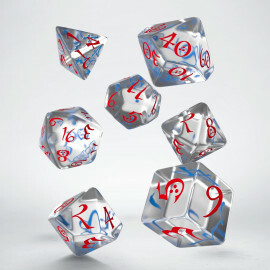 A throw with these dice is really an extraordinary experience. 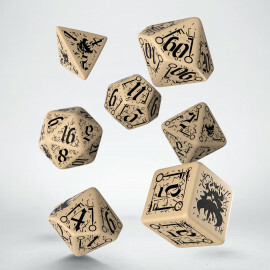 This is a must-have if you belong to an elite club of real RPG fans supporting their hobbies and minding that their characters do not base their fate on an ordinary plastic Fate. The True Destiny should be like metal, hard, sometimes cold, sometimes warmed up, because only the metal will resist everything and withstand any trial. This set, though classic and decorated with the Pathfinder logo instead of the highest number, is also suitable for other games where seven dice determine the fate of the character and make the game full of ups and downs. 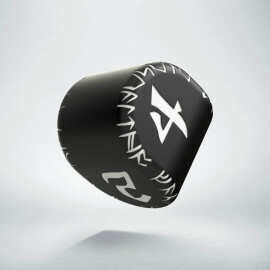 Hurry up, because it is only available in our store and on the auctions! You can’t get it in the FLGS. Creating these dice requires a lot of time. This is not a mass product.